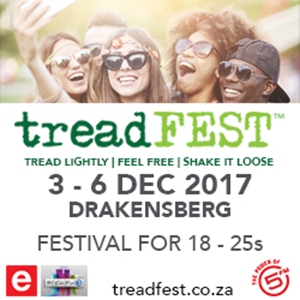 treadFEST, which takes place from 3 to 6 December in the Drakensberg, is a three days of music, celebration, unwinding, connecting, and making memories. The emphasis is on lots of music, food and drink, fresh air, and a host of cultural and sporting activities. Good clean fun plus a great party. It’s a cashless, environmentally-friendly, community-supporting space. treadFEST is a celebration of freedom, fun and friendship. For all 18 to 25 year olds, treadFEST marks new beginnings. It’s not the average but then neither are you. In an increasingly fractured world, we feel the need to tread lightly, to live more sustainably on a healthier planet, to be original and adventurous without leaving damage. treadFEST is about creating fun and exhilaration in a kinder environment, which offers not only a great party, but much, much more. treadFEST is an initiative of 360LiVE – a company dedicated to creating singular, quirky happenings and memorable events – the kind you want to be at – the kind you will remember. After 15 years of creating live events in the corporate space, 360LiVE saw the need to develop an alternative music festival, combining some of the best of South Africa’s young musical talent in a majestic mountain festival. If you are between the ages of 18 and 25, love great music in the great outdoors, adventurous ways of thinking, different ways of seeing, quirky ways of doing, then treadFEST is YOU. treadFEST treads under blue skies, by green rolling mountains and rivers, in the magnificent Drakensberg Amphitheatre. It’s all happening at the Amphitheatre Backpackers’ Lodge on the R74 near Bergville. With a host of outdoor activities to complement the music, this festival is one for feeling free, shaking loose and creating fantastic memories. treadFEST treads from 3 to 6 December 2017. Visit www.treadfest.co.za to book your tread print now. Come tread with us!